45 Millharbour is located at the centre of Isle of Dogs at Millwall Inner Dock, a designated Water Protection Area. This large expanse of water is a dominant characteristic of the area and provides the local community with a unique recreational and amenity space. The building is divided into four blocks, the two tallest (14 storeys) are situated to the east and west of the development and comprise both privately owned and shared ownership units. The eastern block overlooks the dock and boasts beautiful views of the water. The opposite tower faces back to the city with extraordinary views of London’s skyline and famous landmarks. The two central blocks comprising affordable flats and duplexes for Network Housing reach seven storeys in height. 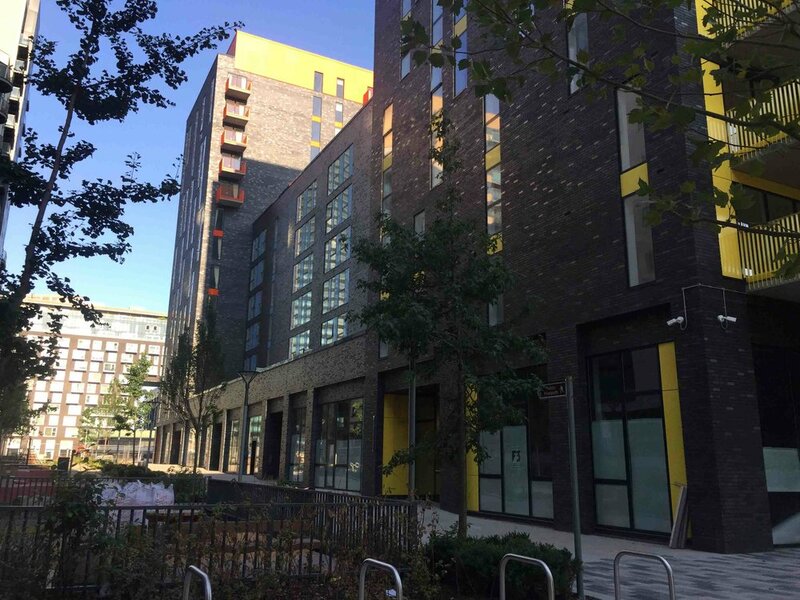 The building provides 138 apartments with commercial units on the ground floor including serviced offices and a cafe, which create active frontages. A landscaped amenity space links Millharbour Road with the Millharbour Inner Dock providing an attractive green public space including play space and bike racks for locals and residents. Most units have generously proportioned private balconies or terraces and access to a large roof terrace at 7th floor level. The development meets level 4 of the Code for Sustainable Homes with commercial units achieving a BREEAM rating of ‘Excellent’. Apartments meet the London Housing Design Standards, Lifetime Homes criteria and are set to achieve Secure by Design Certification. 10% of the apartments are wheelchair adaptable. Two different Hagemeister bricks have been used together; a dark grey and a lighter grey with iridescent coating which are mixed in contrasting ratios on the towers and lower building. Windows are floor to ceiling, high performance; PPC Aluminium-clad, timber coupled to brightly coloured PPC Aluminium insulated panels. A different colour is designated to each block; Yellow, Orange and Powder blue which contrast with the grey brickwork. The top floors of the towers are clad with coloured Trespa panels. Balcony balustrades have brightly coloured PPC vertical fin railings along the edge of exposed concrete balconies. Each block has its own entrance and lobby area, the private towers have brightly coloured resin floors, Corian reception desks and Letter Boxes to match the building accent colours are again set against a deep grey wall and ceiling colour. Affordable reception areas have powder blue vinyl floors and matching letter boxes. The basement houses a 42-space car park, small gym, cycle stores and plant rooms. Private and shared ownership apartments have underfloor heating and engineered timber floors. All apartments have low water consuming sanitary ware, low energy appliances, MVHR units and excellent levels of insulation and airtightness to minimise the requirement for water and energy consumption. There are PV panels on the tower roofs along with an area of brown roof to support biodiversity and an area of relocated Jersey Cudweed, a very rare plant with just two surviving populations in Britain which was discovered on site in the early ecological surveys. The brick elevations incorporate swift and bat boxes.